Every Friday. Old Town invites show-quality muscle and performance cars and trucks from 1964 and newer and classics from 1987 and older to join others in the ultimate display of engine power. Cars begin showing up late afternoon and then show off these muscle machines as they drive down the Main Street of Old Town at 8:30pm.Weekly cash prizes, drawings and giveaways for our cruisers. Free live entertainment on Trophy Row Stage beginning at 7:00pm. Every month on the third Friday. There are numerous shops, restaurants, pubs and more on the square for you to visit and there is 50’s – 60’s music as well. Every Friday. Hosted by the Lakeland Cruisers, in the Big Lots plaza. 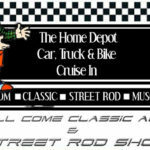 Open to all classic cars, and features 50’s and 60’s music, door prizes, 50/50 drawing, trophies. Every month on the third Friday. Weather permitting. Open to all years, makes and models of vehicles. This is a family community event and is very children friendly. Award winning BBQ and more for all to enjoy. Y’all come on out for a evening of family fun, hot cars and the greatest folks in the world. Every Friday. Hosted by the Asphalt Angels. There’s muisc, door prizes, and raffles, plus nine restaurants, a cinema house, and lots of shopping. Join us for a fun night of cool rides and great wood fire pizza at Knot Just Pizza. The cruise-in is open to all classic, custom, or cool with a 10% discount to show rides in the show area. There is also a $25.00 gift card for “owners choice”. In addition to great pizza with over 30 toppings, you may enjoy a panini’s, sandwiches, pasta, and desserts too. Also open for breakfast! DJ/MC Rockin Rich Bedford and LIVE broadcast on www.rollbackradio.com. FREE EVENT. Every month on the third Friday. Presented by Kampala Kustomz of London and Air2Water. This event is for all Volkswagen, Audi, Bentley, Buggati, Lamborhgini, Porsche and Ducati. Happy hour 4-7pm. Ace Cafe is THE place for all things cars, bikes and rock n’ roll. With a full-service restaurant, art gallery and live music; there’s something for everyone. Plus it is dog friendly. Every Friday. Open to all cars, trucks and motorcycles. Bring your ride finished or still under construction. This is a casual meet and greet, so come tell your stories. No awards, door prizes, or any other competition. Just good times and conversations. In front of the Sebring Walmart. Please no burnouts, alcohol, loud music. This is family oriented event. Every month on the third Friday. Presented by the Men’s Group and hosted by Holly, Moose & Friends. All makes and models of cool cars and trucks welcome. Sunlight Choice award, 50/50, door prizes and music. Hot Diggity Dog food truck will be featuring Sabrett’s dogs and White Castle burgers. 150 parking spaces are available. Please arrive after 5;30pm.